The debris from Bonfire Night on the field owned by Karbon Homes in Stobhill, Morpeth. A Morpeth town councillor has said it is ‘absolutely disgraceful’ that debris from Bonfire Night in an area of Stobhill has yet to be cleared. Various items were added to the fire on November 5 on a field owned by the Karbon Homes housing association, which is located near the Stobhill Centre operated by Barnabas Safe and Sound. 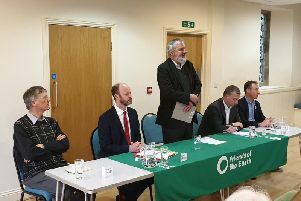 Coun Joao Parreira, who lives close to the field, is among those who have raised concerns with the association and the town council has contacted it on a number of occasions. He says other local residents have contacted him about the debris, as they also believe it poses a safety risk. Karbon Homes has stated that the work is scheduled to take place next week and the reason why the debris could not be cleared quickly is because it needs a ‘contractor to attend with appropriate machinery’. Coun Parreira said: “Every single time that we’ve contacted Karbon Homes, we are ignored or receive an excuse to say why the mess has not been cleared up yet. “It’s absolutely disgraceful that the debris has not been removed now that it’s almost three months since bonfire night. “There is glass, metal, pottery and other items all in there and they pose a safety risk, particularly when children are playing nearby. John Gray, grounds maintenance operations manager for Karbon Homes, said: “We have been aware of the condition of this site for some time now and have previously sent staff to clear debris by hand. “However, for the work to be completed to a satisfactory standard, we needed to arrange for a contractor to attend with appropriate machinery. “This will now take place next week, unless severe weather prevents our contractor getting on site.